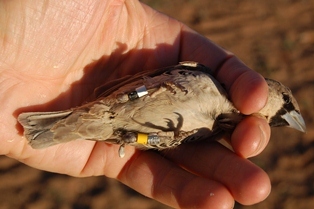 In addition to attending these two back-to-back events, I arrived in Windhoek a few days earlier to do some additional bird ringing. 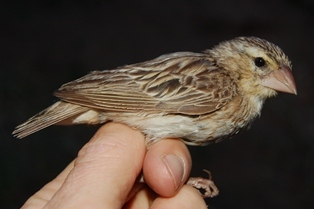 I arrived on 27 April late afternoon, in time for some early morning ringing (28 April) at the home of Neil Thomson. 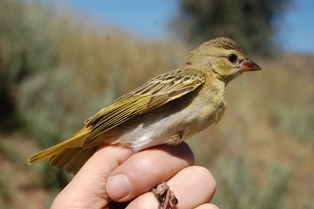 Most of the birds caught were recaptures, including Southern Masked Weaver male BH70290 that Neil first ringed in 2009. Neil and I then spent the rest of the day at Heiko dam, Teufelsbach farm. There was a variety of weavers (for me!) 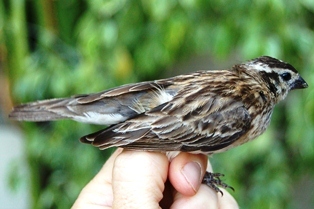 and other seedeaters (for Neil!). 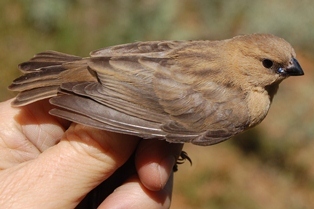 In addition to the weavers illustrated below, there were lots of juvenile Red-billed Queleas. 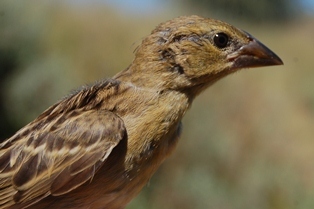 Both Violet-eared Waxbill and Shaft-tailed Whydah juveniles were caught - both showed a bluish gape flange but the waxbill had a bluish tinge to the rump and a longer tail. 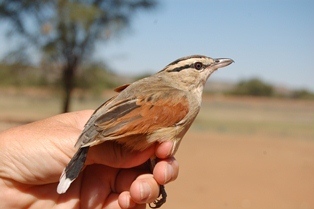 On Sunday 29 April I ringed outside Neil's garden for the day, while Arnold van der Westhuizen held an atlasing workshop for members of the Namibia Bird Club. 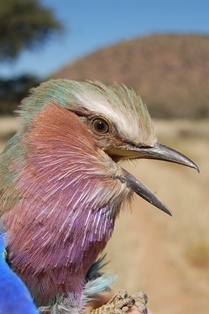 To celebrate their 50th anniversary, the Namibia Bird Club held a two-day symposium with invited speakers. 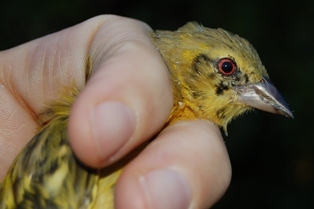 Before the talks began, there were early morning atlassing outings - I used the opportunity to do some more ringing. 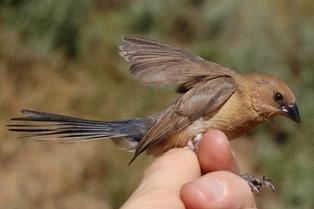 On 30 April I caught my first Paradise Whydah at Neil's home. 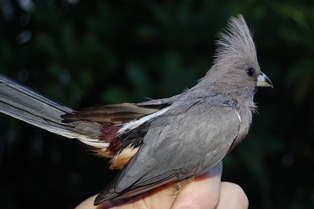 On the next morning I ringed at Holger's house as they had lots of Southern Red Bishops. 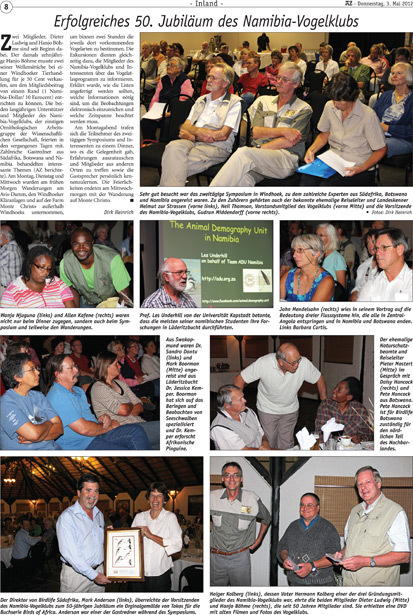 The bird club the symposium was held at the Arebbusch Lodge in Windhoek. 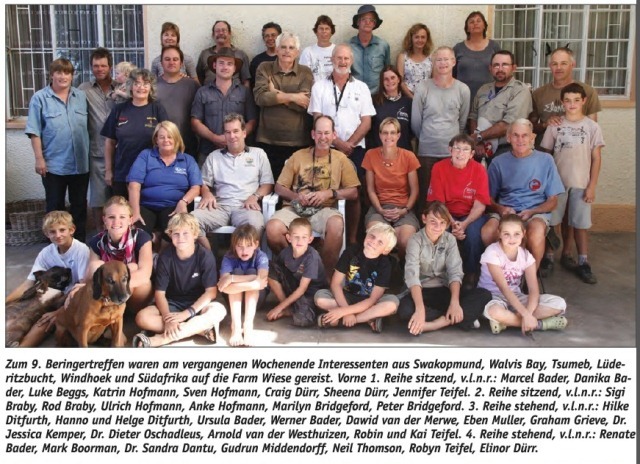 The picture (below, right) comes from the daily newspaper in Windhoek, Allgemaine Zeitung and is a collage of symposium highlights. 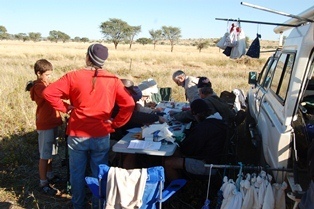 Vultures, flamingos, seabirds, a virtual photographic birding tour through Angola, the GPS tracks of Black Harriers, birds not contained by borders, the importance of weaver research and the Namibian connections to the ADU were amongst the topics that were presented. 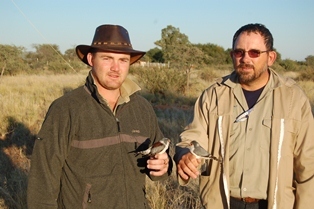 At the end of the symposium programme, Chris Brown officially launched bird atlasing in Namibia (see also German article online here) . The final event of the anniversary was a morning outing to Monte Christo farm to atlas and ring. Few birds were caught because there is much water on the farm, with some Three-banded Plovers being the most interesting catch. 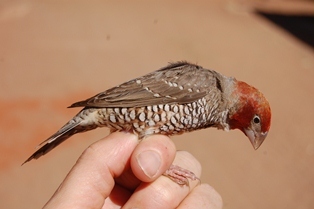 The only weavers to be caught were juvenile Red-billed Queleas. 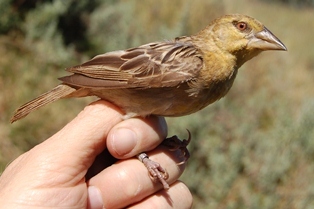 Lots of PHOWN records, particularly of Red-billed Buffalo Weaver nests were obtained. 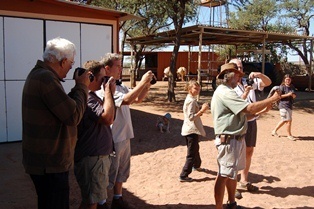 The first Namibian ringers get-together was held at Wiese farm in 2004 (see trip report here), making this year their 9th get-together. One of the aims at the get-together was to retrap and colour ring Sociable Weavers at several different colonies. 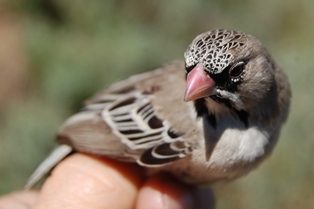 The ringing at the colonies went very well, and also provided at opportunity to observe other bird species associated with the weavers - see Sociable Weaver associations. In the evenings there were a variety of talks. 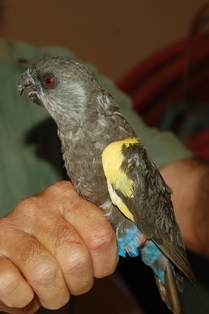 Bird ringer and journalist Dirk Heinrich wrote several articles about the Ringers Get-Together in the Allgemeine Zeitung. These can be downloaded as pdfs (text is German!). 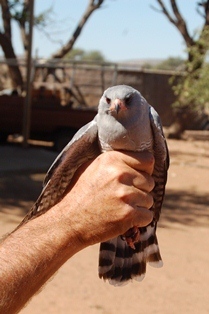 Thanks to the Namibia Bird Club for inviting me, and paying for my flight! Thanks to the Bader family (Ursula, Werner & Renate, and children) for catering and hosting us so well!